What a week it has been here in Sydney. This blog is off topic, yes, but this week has been significant in a tragic way and every time I went to write out a recipe for jellies this week, all I wanted to do was share this piece, so here it is. I remember distinctly helping with packing all the garlic orders at my mum in law’s in the country on Monday when the initial news broke out that there was a hostage situation in the Lindt Cafe in Martin Place… there was also drama with Opera House evacuations and baricades in the streets and office buildings being in lock down. I had a pang in my chest that all of a sudden I should be with my family. When you’re far away from your peeps, news like this feels horrible especially the way they were initially reporting things. I didn’t like being away from my son. I had to stay though (too much garlic packing to do!) and I rationalised that we didn’t know whether this was media exaggeration yet or not. I called my sister. She’d gone home sick and escaped the lock down in her building by 15 minutes. Mum was at the hairdressers. Dad at his office in Homebush. Husband in St Leonard’s. Son at kindy in the east. Good. All good then. Except for the fact that all those people were trapped by a psycho with a gun and gosh knows what else, in the Lindt cafe. 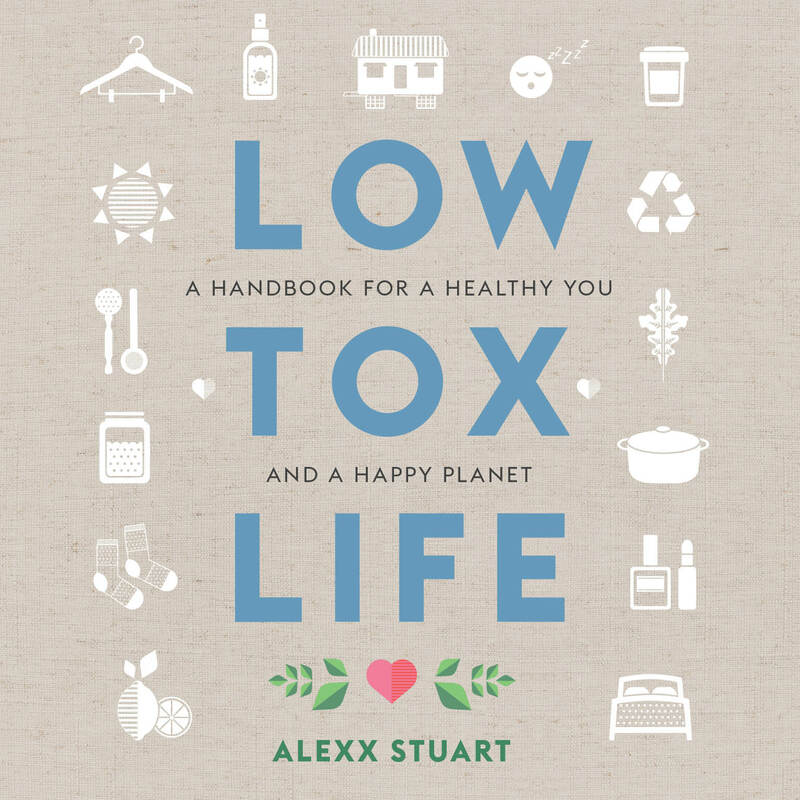 Anyway, that night once I was back home, I heard from one of the women who did my 30 days to your low tox life course, that a friend of hers was a hostage in there. We were a very close group by the end of that course, and the news rocked the group and the messages of hope poured from everyone. I then heard from a friend that one of her closest friends ‘Katrina’ was in there. I posted on my page for us to all send good vibes to the friend who was in there, still not realising who it was. I couldn’t sleep that night, as I’m sure most people couldn’t. It didn’t feel right. It felt selfish to just toddle off to sleep, when there was such a horrible thing happening in our city. The next morning I awoke at 5.30 with just a few hours sleep and saw there were two victims. Tragedy. I was so sure there’d be a relieving, happy ending. They were still unnamed but I knew a woman was 38 years old and I felt sick to the stomach. That was the vintage of the women who had said their friend was in there. Please no. I messaged my friend and the girl from my course and said, please tell me your friend is ok? I got a message back: She didn’t make it. Devastating. An hour later, the names were revealed. 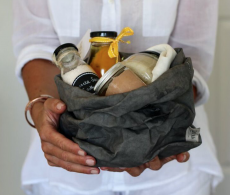 Tori Johnston and… Katrina Dawson. Oh. My. God. I had known her. We were at preschool together. I later played at my friend Rebecca’s house across the road with her, as they went to the same school. I hadn’t seen her since, but my memories of her were of a super friendly and positive girl… it was a name I always knew and I could not conceive of something so devastating happening here in Sydney to someone I once knew? Not possible. All the feelings came on over the next few days. I feel guilty for being able to cuddle my son but then, I feel never more grateful than today and tomorrow, to be able to do it as much as I want. That little guy has practically suffocated with all my cuddling. I feel devastated that the 3 children don’t have their mum anymore. Just devastated. It matters not to them that she died a hero. It matters to them that they won’t get their bed time stories with her sweet loving voice and cuddles and ‘mummy’s here darling, it’s ok’. She’s not. I’m infuriated. I feel totally ill that her husband has lost his beautiful, brilliant wife and that he has to cope with his own grief as well as the grief of his children as they work the slow road to bringing back joy into their lives. Totally sick to my stomach and sad about how much of a challenge this will be for him. I imagine his mixed anger and frustration at his wife being a hero to her colleague, shielding her and her unborn child… why couldn’t she be a little selfish and save herself? For him. For their kids. The turmoil must be unimaginable. Is there room for him to be proud? Probably not yet. Who knows. The friend’s turmoil must be equally unimaginable. This baby will be born and no doubt know thanks to his mum that his life is so, so precious, given to him by a remarkable woman as the very last gift she would ever have the power to give. I feel like the world is going mad, when then hearing a day later about a school being stormed, with 135 victims, mostly children, in Pakinstan. WHY???? A school???? How can you lose touch with love so, so much to think such a thing is nothing more than a clever tactical message to the world? There are good feelings too, of course. I feel so hopeful that during and post tragedy, we have banded together as a big community. 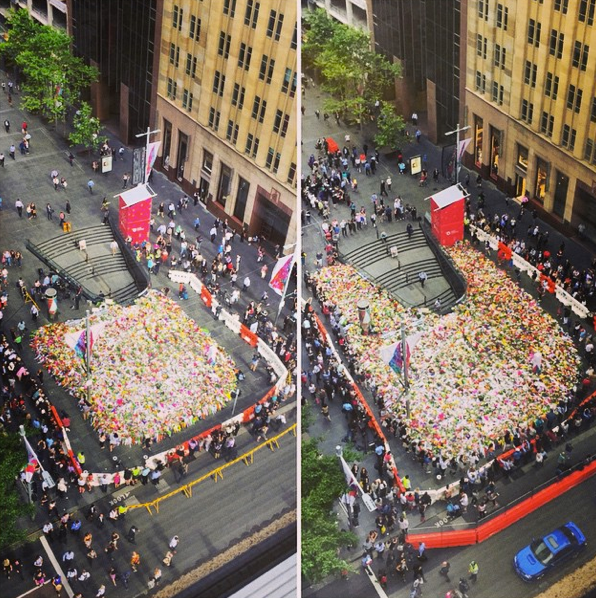 The exquisite display of flowers in memorium in Martin Place must be seen to be believed – it must be smelt! I feel so happy that Sydney chose LOVE. We made sure that our fellow Muslim community members didn’t feel that we were lumping them in the same boat as this nut job psycho on his crazy lone mission, filled with fear and hate all at once. The #illridewithyou hashtag was a thing of beauty, hope and I was and am so proud to be Australian – London born, French mum, 1st generation like so many from so many other countries and cultures. I feel the delicious weight of life’s preciousness. Every ounce of it. I feel a little bit on edge – a little fragile. Do you? I’m determined for this not to last. 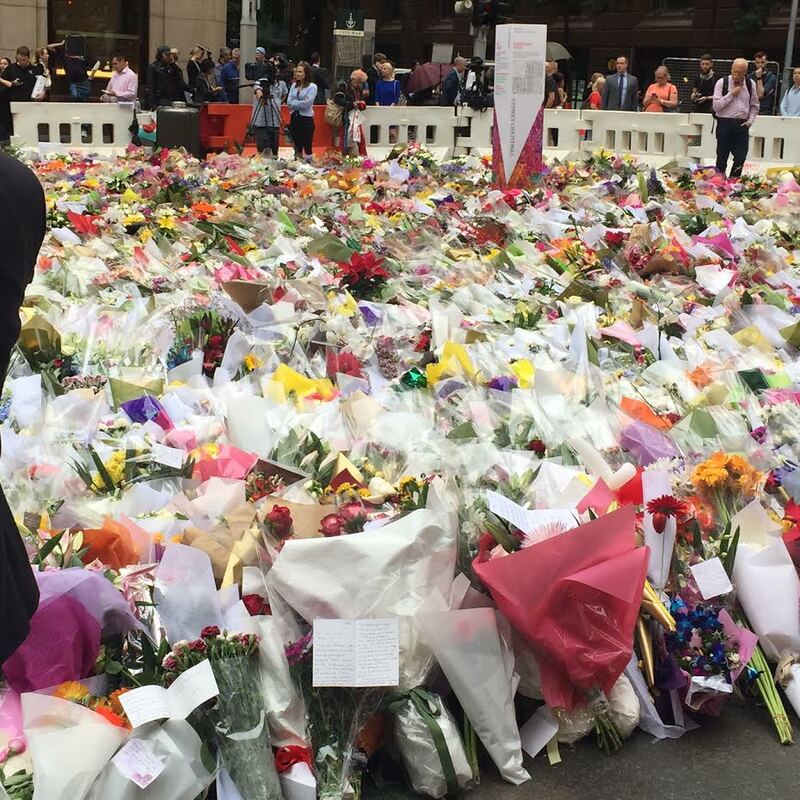 This morning, I went for a long walk down towards Martin Place to pay my respects and lay down some flowers. I popped into the florist in Darlinghurst and while he was wrapping the bouquet a guy came in sweating profusely, bottle of water in hand, claiming he’d not slept for 2 days and needed to use the phone to call his mobile. The shop keeper got stern with him repeating that he was with someone, the man got agressive back. It was clear the dude was on drugs and rather mad. Anyway, he ended up storming out. BUT, I did think to myself, am I the unlucky girl in the flower shop that just happened to be there when a crazy guy walked in and went off the rails, stabbing her and the shop keeper? I thought “how easily could this turn into me being a news story”. That might be morbid, but in a split second, such thoughts went through my head. Lucky of course, it wasn’t, and to be honest, in my rational mind, he was just a man who was on edge after too many drugs and no sleep. Because of Monday’s events, I have a heightened sense of awareness for how easily things can turn south and how an ordinary day where you just pop in to buy flowers or get a coffee, can be the day a crazy guy walks in with a crazy agenda. So, I continued my walk and I could feel with everyone’s knowing melncholy smiles, that they knew where I was headed. Martin Place was breathtaking – exquisite and melancholy all at once. People connected, they smiled, they read the messages. I laid my bouquet down. I cried. I stood staring over the baricades at the sea of flowers for a good while. I’d never felt such pride in my country, such sadness, such joy at seeing the best in humanity, such resignation that we are so apocalyptic as humans, needing disaster to strike to band together and unite – Why are we like that? Maybe it’s that we need the extreme lows to appreciate the highs and the fortune. pic credit for this above shot of morning and then afternoon: Sunrise on 7. I feel a new appreciation for the short time we are here – a time that can be even shorter than we’d anticipated, in the blink of an eye and completely out of our control. I feel like we owe everyone who has fallen at the hand of senseless violence this week, a big fat gratitude for life and a further culling of any first world problems we indulge. In the great words of Elsa – sing it with me “Let it gooooo, let it goooo”. How has this affected you? How are you feeling? What are you feeling? I’ll sign off by saying we are all sending oodles of love to Katrina and Tori’s families and the strength to get through this grief and heal. Thank you for your words Alexx. It was horrible to see the events unfold on Monday. A girl I work with is friends with the pregnant lady that Katrina was protecting. I can’t imagine what it must be like for the families of Katrina &Tori, or the hostages who survived. This week. I’ve found myself tearsy, often for no apparent reason, but Ive also been more grateful for life and the precious gift it is. Like you, I’ve thought about just how easy it could be to ‘be in the wrong place at the wrong time’, who could imagine that buying your morning coffee could turn into this? 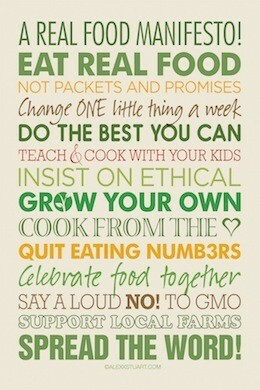 It would be easy, but I refuse to allow this to change how I live my life because this would mean they win! We must stand together in unity and peace. My husband works two blocks from the site of the Boston Marathon bombings and witnessed the explosions go off last year. He had been at the finish line two hours earlier. I was so, so grateful to see him after he walked home from the office later that day. We live close enough (even across the river) for me to hear them as well. Our city was on lockdown, as the perpetrators lived here and part of the manhunt was conducted for several days later – we couldn’t leave our apartments and homes and the constant drone of helicopters was the background noise. And this made me realize what it must be like for people in places like Gaza or Sudan almost every single day. My trainer had just finished running the marathon and was at a hotel across the street. Her husband was with her and knew exactly what was happening, so he told her to just walk directly home and (he’s an ER doc) he proceeded to jump in and help those in need before heading to the hospital. It was all surreal and generate the same kind of response that I have seen at home this past week. It brings people together and hopefully the positive impact (the community togetherness, kindness, awareness) reverberates and creates lasting change. I have some of the same thoughts you do, but try to overcome them by just being aware (no headphones on the subway or even while walking), looking people in the eye, knowing where I am, and not trying to imagine the worst (which I struggle with a lot). I hope that you will overcome some of the difficult feelings that are lingering for you this week. Thanks for this post , Alex. They say Australia is a big country, but this week I think Australia got alot smaller as we all united in this grief. 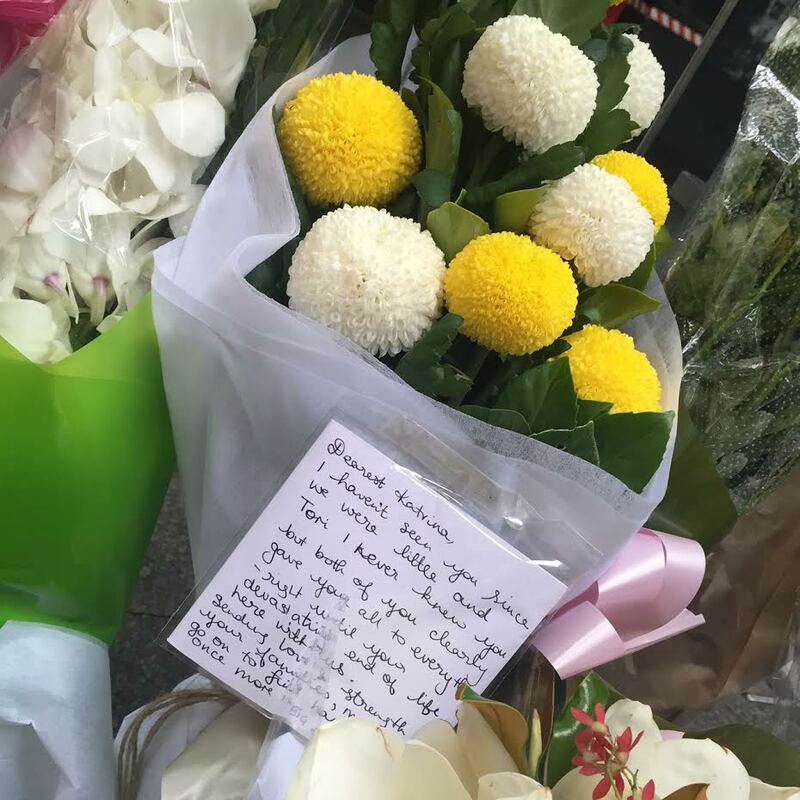 The city always feels so far away for us here on the farm and I love that you went to Martin Place and placed a bouquet because it felt like I was there too as I read it. It was such a sad thing to happen but I so love that Australians have shown the world that reaching out to one another is the answer.